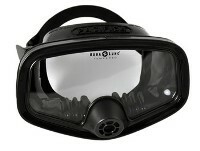 The Atlantis Mask continues to be popular with recreational and military divers for the large single lens, which offers a wide field of view. With a large single lens, low volume, and Black silicone skirt, the Maui is popular with armed services worldwide. 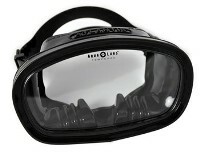 The Micromask delivers a wide-angle view in an ultra-compact package. Its innovative, patented structure positions the lenses inside the “ocular orbit” or the natural facial recesses of the eyes. This close proximity of the lenses to the eyes significantly improves peripheral vision while maintaining an incredibly low internal volume. Ultra low internal volume makes clearing fast and nearly effortless. Compact shape reduces in-water drag and improves stability in a strong current. Cardanic Joint Buckles rotate both up-and-down and in-and-out. The Pacifica Mask continues to be popular with recreational and military divers for the large single lens, which offers a wide field of view. The Wraparound Mask continues to be the mask of choice for Military and Search and Rescue Departments worldwide. Modernized with a redesigned skirt for improved fit, metal buckles, and black non-reflective stainless steel frame.